It was a simple sign that dared the onlooker for the adventure of a lifetime– bungee jumping. This was Australia after all, a land known for deadly spiders, boxing marsupials, and thrill-seeking adventure. I nudged my mom and pointed to the sign. “I’m going to do it”, I said jokingly. “Sure you are”, my mom replied. 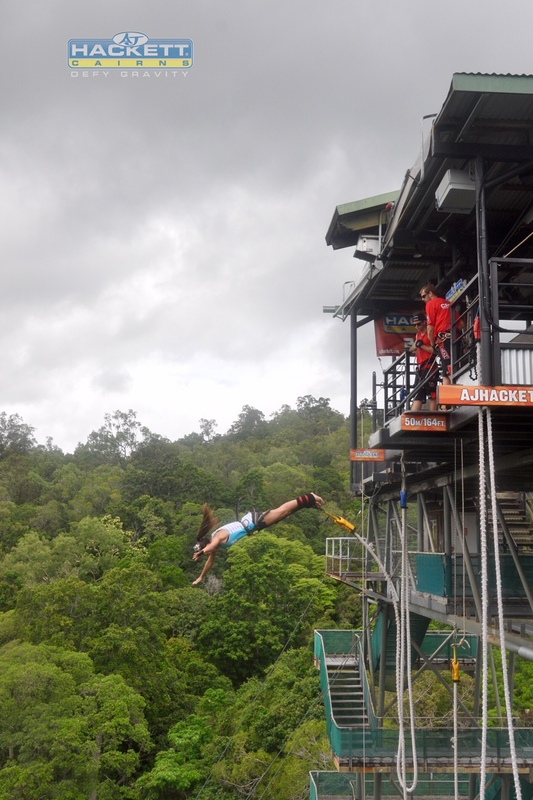 To further mess with my parents I picked up a AJ Hackett bungee jumping brochure (https://www.ajhackett.com/cairns/activities/bungy/) and stuffed it into my bag for later tormenting. Being an only child means my family and I travel a lot, and I’m known for doing adventurous things such as zip lining upside down, swimming with whale sharks, and rappelling down cliffs. My mom is always there to encourage me to try new things (and pay for them), but even she knew bungee jumping was like nothing I had ever attempted before. At the hotel I opened the brochure and began to skim over the pictures and the brief descriptions in a dramatic manner. “Lemme see that”, my mom said, as she began to read the document closely. “Yeah you can do it, it’s only 164 feet high”. “Yeah, no problem at all”, I replied in a snarky tone. I still couldn’t tell if she was serious or not. The next day she took me to the concierge desk to book my jump time. Ok… so maybe she is serious I thought to myself. Not 24 hours later did I realize how serious she was when I was climbing the 16 flights of stairs to the top of a rickety bridge overlooking the jungle canopy. I think my ears popped twice on the way up. As the bungee operators helped me into my harness I could feel my heartbeat out of my chest and I looked at my mom on the other side of the railing. She made a motion for me to just breathe and calm down. I was then instructed to walk to the edge of the platform and put my toes over the edge. “Ok, one, two, three jump!” said the man who held my lifeline-literally. To say that I was terrified would be an understatement. My hands were damp with sweat, and my whole body was stiff with fear. I had never been so close to quitting something in my entire life. It may sound odd, but the one thing I couldn’t get out of my head was the t-shirt I saw while at the registration desk. It had a cartoon chicken on it and read, “I was too chicken to jump” and I had no intention of being a chicken. “Uh just jump?”, I questioned. “OK”. And away I went. I don’t exactly remember screaming, but it was quite evident I did in the numerous videos taken of my daring jump. To my surprise, my stomach didn’t drop like it does when you ride a roller coaster, I could barely even tell that I was falling, except for the ever-approaching ground. At the bottom my mom and dad were there to congratulate me. I asked my mom how she knew I’d go through with bungee jumping and she told me she knew I wouldn’t want to miss this opportunity and I could do it if I had someone to give me a little push — figuratively of course. Ever since that day whenever I am doing something new or something that scares me, I always remind myself that if I can go bungee jumping, I can do this. Life is too short to be standing on the ground with a cartoon chicken on your shirt.